Good Morning from Japan. The past 24 hours has engage taste buds, introduced a new kind of comfort, stirred up our smiles and admiration for the Japanese tradition. 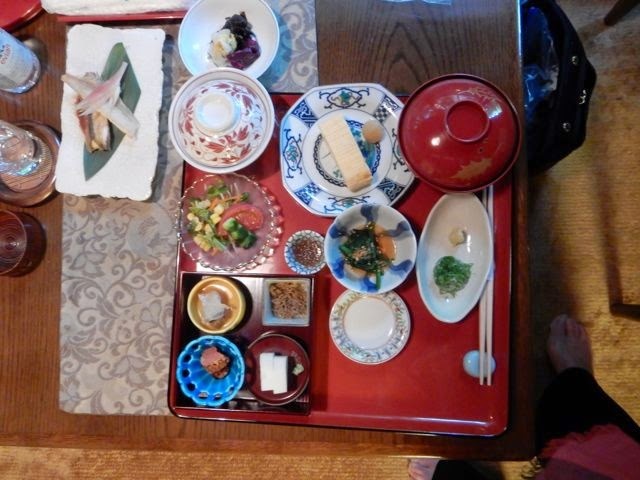 To begin with, we spent one night in a traditional ryokan. 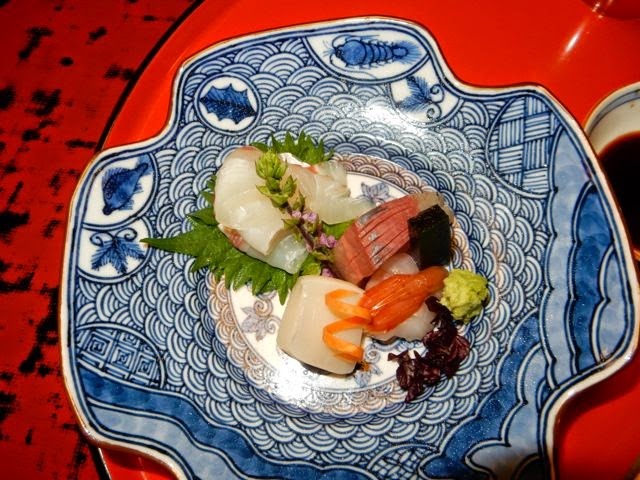 Like so much of Kyoto, a ryokan, hidden on the immaculate narrow streets where it is hard to tell the beauty behind the wooden fronts, hangs on to historical hospitality at its finest. 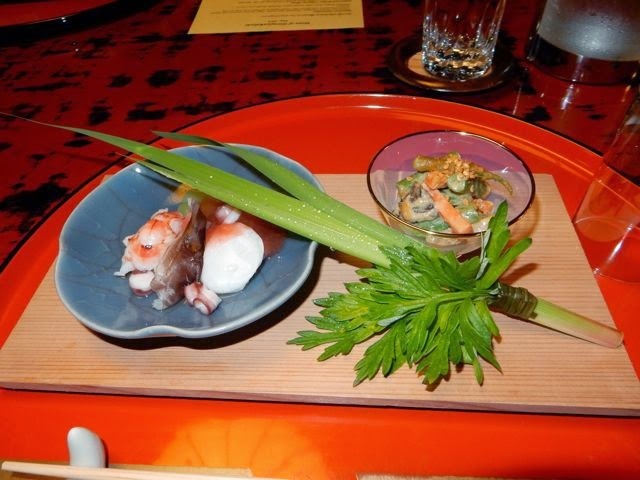 It is called “omotenashi” and is a family business (like an inn) where the proverbial red carpet is rolled out for you as you experience traditional life in Japan. 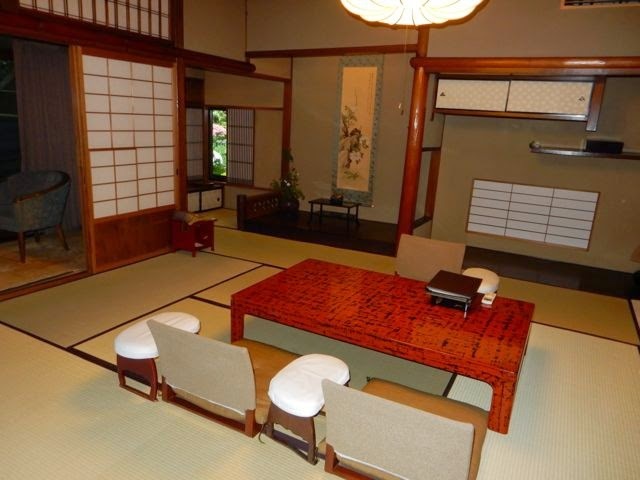 The staff is run by women in kimonos and the white two-toed socks, who continue to bow in humility and welcome when you cross the threshold, until you are safely in your room. We arrived with our baggage (in more ways than one), slipped out of our shoes backward - so as not to step on the dirty entrance floor mat and track dirt inside - and were assigned to one sizeable room. The floors are covered in mats. The decor is minimal, in fact, the only furniture is a beautiful low lacquered table about 12 inches off the ground which has four chairs and four tiny tables with pillows for leaning on. The walls are paper. The windows extend us into intimate gardens with orange and white koi (fish), and you wonder, where do we sleep. Nothing is lockable. Trust is primary. A traditional shower where you sit on a bench to lather up, then pour warm water over you - to clean off so you can sit in the hot tub hiding under a wooden cove - is hidden behind another screen, and the only modern “gadget” is the heated toilet (which is a comfort you cannot imagine.) No TV. No music. Just peace everywhere. And wi-fi. The brave can leave their quarters and participate in a communal hot bath. That was not on my agenda. (everything is a small helping or bite) of fruit - one of which was green melon better than any I’ve ever tasted. James and I looked at each other as it dawned on us, as we turned the piece over to look at the rhine, this was a thin slice of the beautiful melons we had seen priced at $220 a piece. Now that was a kick! 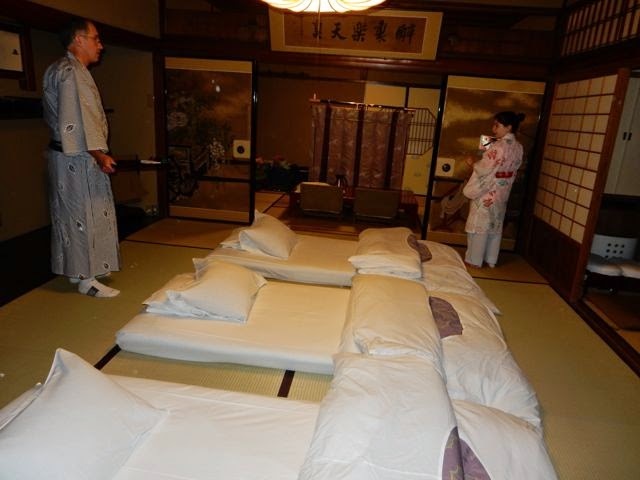 After dinner, we moved out of the way so the Waka-okami could clear out table, chair backs, and used eating equipment and in its place put three double size mattresses called futons, with duvets and pillows and hope of sleep. It took me three seconds to fold back up and plop down on the mattress and forgetabout my discomfort for the night - until I had to get up for a bathroom visit, no lights, no noise, and awakening my knees and toes to keep me balanced for a few minutes. All that silence and peace is a good thing, but since we three slept side by side (on individual mattresses), our own quirks of sleeping were present. I was up at 4 a.m. to write my blog at the one normal chair and table off to a side niche in the room. definitely an overload for someone who grabs a spoonful of yoghurt and pureed fruit to start her day back home. 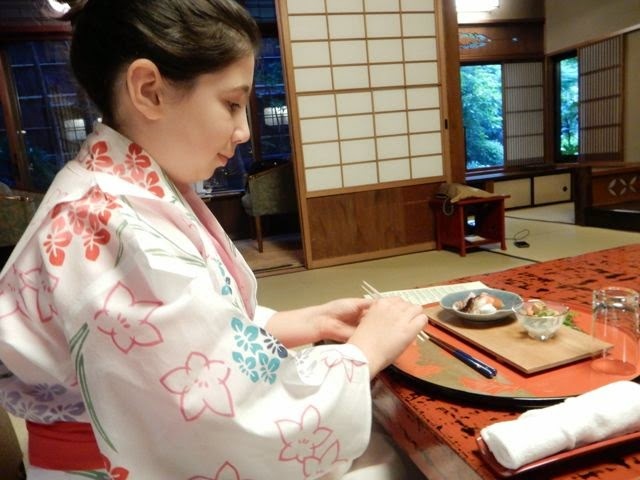 The Ryokan experience got me closer to Japanese culture and my appreciation of it. People care about your comfort and condition. There is just no bitterness or complaint or disruptions in the old way. And the staff stands at the entrance and waves Sayonara to you until your car is out of sight. Life is good.